It all starts with quality soybeans, mature and fully-grown. They are soaked overnight then steamed and ground to a pulp with water. The okara (soy pulp) is then separated from the liquid. The liquid from this seemingly-simple-but-nuanced process is soy milk–thick, creamy milk that is the base of fresh tofu. 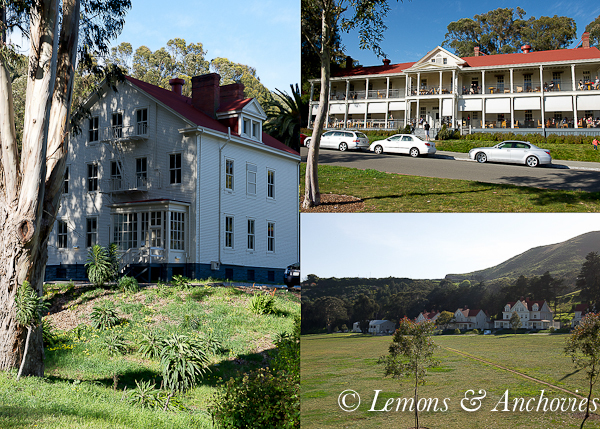 I finally had the opportunity to attend a cooking class last week at the Cavallo Point Cooking School in Fort Baker. It was a beautiful San Francisco day and while locals and tourists alike lounged outdoors to soak in the sun, I was excited about spending the afternoon indoors to attend my first cooking class since I was a teenager. 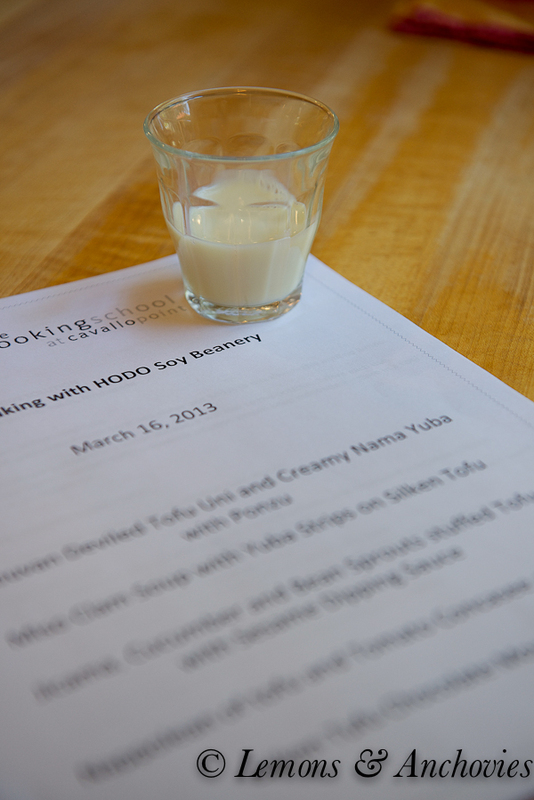 When I saw the tofu-making session taught by Minh Tsai, the Tofu Master of Hodo Soy Beanery in Oakland, I quickly signed up. It was a fun, educational experience from the start. The class kicked off with a history lesson of tofu’s introduction to the United States in the 1970s through “The Book of Tofu” (William Shurtleff) to be one of the foods of the green revolution. 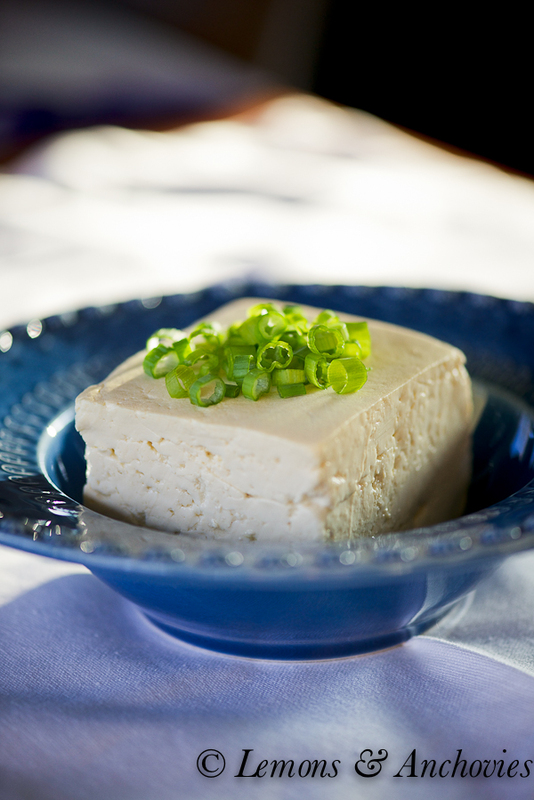 Tofu has seen an ebb and flow in popularity since then, largely due to the deterioration of quality resulting from mass production. Today, providing high-quality fresh, tasty tofu, yuba and soymilk from organic, non-GMO soybeans is the driving force behind Hodo Soy Beanery. I understood the (highly-simplified) science of the process–the interaction of soy milk with a coagulant (in this case calcium sulfate)–but the liquid turning into beautiful, silken tofu in what seemed like only seconds was like magic before my eyes. In reality, the success of creating silken tofu is due in part to the proper pouring of steamed soymilk into the calcium sulfate. As Mr. Tsai noted, tofu-making can be temperamental. If one pours too fast or too slowly, the two will not come together successfully. 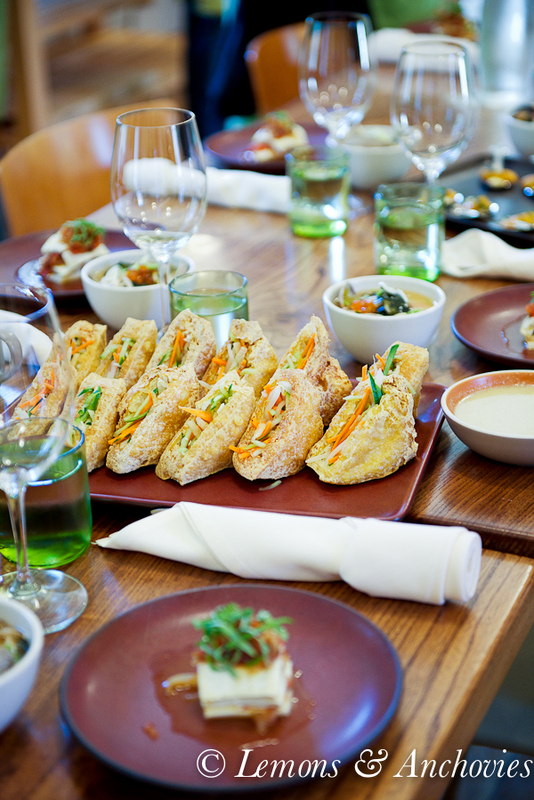 But when done right, as was demonstrated in the class, silken tofu is a sight to behold and results in a clean, fine, fresh-tasting experience. 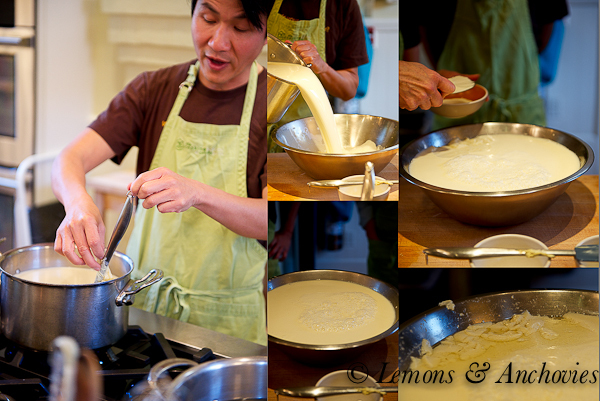 I ate fresh tofu as a child and I had forgotten how good it could be until I sampled the fresh batch from this class. The introduction to tofu-making complete, we continued on to the next lesson: turning silken tofu into medium-firm block tofu. Pictured above is Mr. Tsai spooning silken tofu into a wooden mold lined with cloth. It is then pressed to extract most of the liquid, allowing the tofu to set. 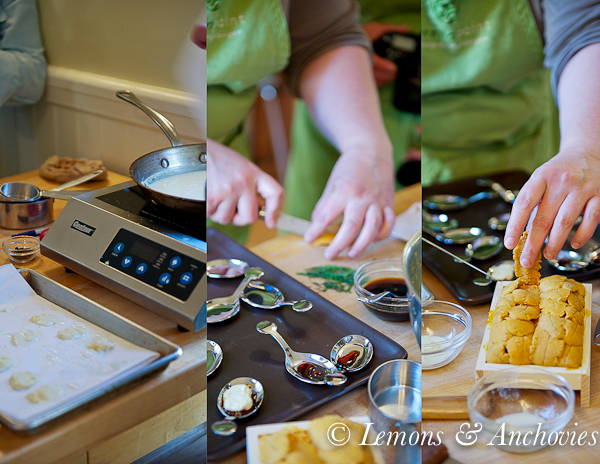 During the couple of hours that it took this process to be completed the class was broken up into groups to create the several recipes using the fresh tofu. For the amuse-bouche we had creamy nama yuba. 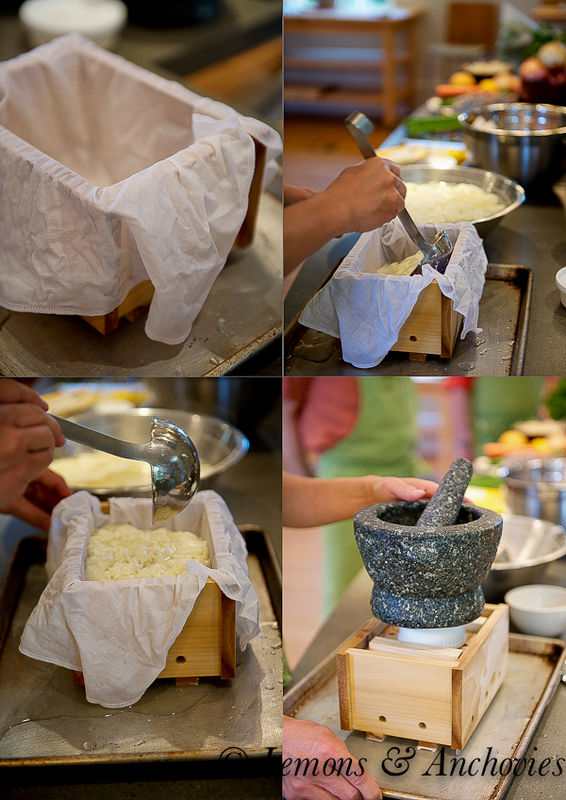 Yuba is the “skin” that forms on top of heated soymilk. According to Mr. Tsai, this is one of the most prized forms of soy, creamy and delicate. Thin sheets of yuba can be used as wraps or cut into noodles but in the class a student skimmed layers of it from a pan of heated soymilk which was then layered with ponzu and fresh uni (sea urchin) and garnished with shiso (pictured above). The next bite was a Vadouvan Deviled tofu. A vegan take on deviled eggs, this is a combination of mashed tofu, Indian spices, celery, shallots, raisins and vegan mayonnaise made with blended soymilk and mustard. Served on top of rice crackers, these appetizers had the mouth feel of real deviled eggs and were a little too easy to pop in my mouth. One of my favorite recipes of the day. The next course was the Miso Clam Soup wih Yuba Strips on Silken Tofu. I was part of the small group that prepared this soup and I will admit that I moved to this part of the room only to fill an empty slot. The spaces for dessert and the other recipes filled quickly and I thought I’d gotten the short end of the stick, not expecting to learn much from preparing soup that was already a staple in my home. I was wrong. This ended up being my favorite recipe of the day. This was miso soup like I’ve never had. The bottom layer consisted of silken tofu which we poured into the serving bowls ourselves (remember what I explained above–there is a special art in pouring the milk to combine with the coagulant–and we were able to get a feel for what a proper pour should be like). 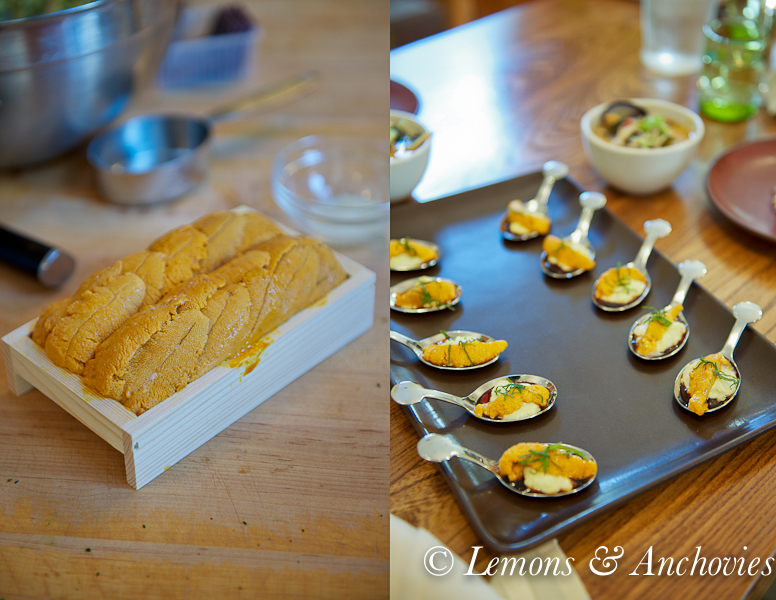 The tofu was topped with broth, Manila clams, mushrooms, yuba strips, mitsuba (a Japanese herb) and ikura (salmon roe). I can’t even begin to describe how special this soup tasted. From the delicate textures to the layers of flavor, this soup alone, along with being educated about making tofu, made the class so worthwhile for me. We tasted a few more dishes: Napoleon of Tofu, Silken Tofu Chocolate Mousse and Jicama, Cucumber and Bean Sprout Stuffed Tofu with Sesame Dipping sauce (another great recipe). At the end of the class we all sat at the table and enjoyed our creations together over wine. It was three hours well spent with lots of learning from great instructors in a beautiful setting with other friendly, equally-enthusiastic students. And as if the session itself weren’t treat enough, I was able to take home a small block of the medium-firm tofu that Mr. Tsai had prepared earlier. 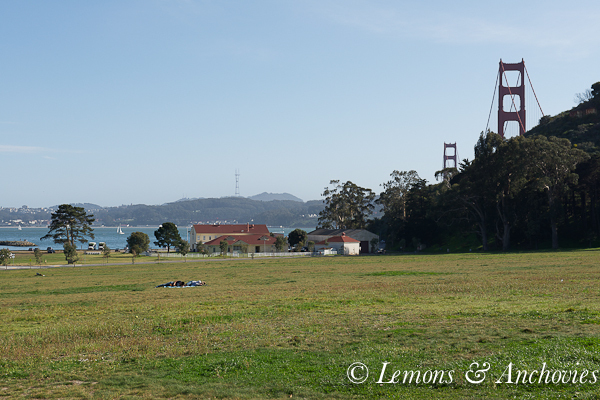 I walked out of the Cavallo Point building to a slight San Francisco breeze, a peek of the Golden Gate Bridge and boats sailing on the Bay visible beyond the grounds of the lodge. The late-afternoon batch of locals and tourists sat on the porch enjoying the same vista, their first glass of wine of the evening in their hand. Me? Instead of wine, in my hand was my precious block of freshly-made tofu. I walked to my car, my wheels spinning on what I would create with my souvenir so my husband could experience even a little of the fun I had in class. 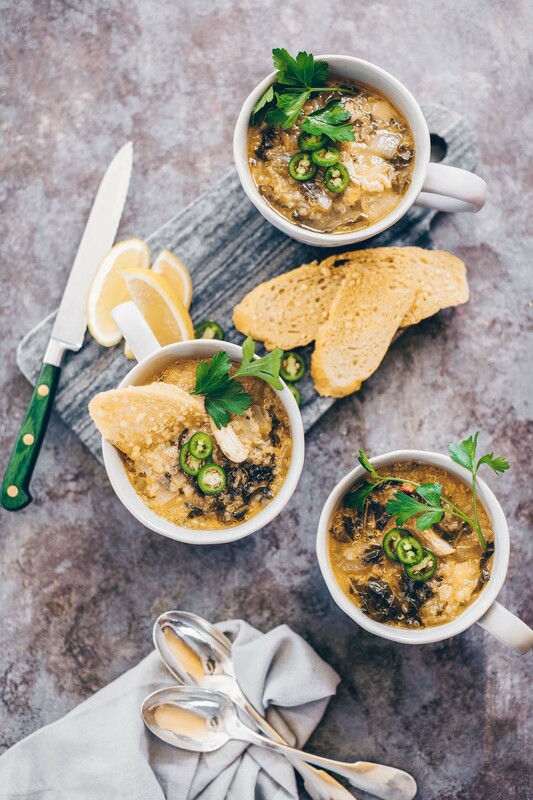 * Recipes for the Miso Clam Soup and Deviled Tofu posted below with permission from Mr. Tsai and the Cavallo Point Cooking School. 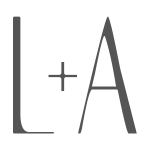 You can find Mr. Tsai’s blog here. * The beanery offers one public tour each month, allowing individuals to see Hodo Soy’s artisans at work. ** Also a special congratulations to Hodo Soy for their new partnership with the Chipotle chain of restaurants. The latter has just rolled out a new vegetarian menu item called “Sofritas” (available in select Bay Area restaurants) for which Hodo Soy will be providing the tofu. One word to describe this soup? Special. Courtesy of Linda Tay Esposito. To make the dash (broth), combine the kombu and water in a saucepan. Wait 15 minutes then bring the water to an almost-boil. Remove from heat, sprinkle the bonito flakes and let steep for 15 minutes. Strain out the kombu and bonito, discard the solids and transfer the broth to a pot. Add a couple of tablespoons of the dashi to the miso to create a smooth paste. Add the softened miso to the rest of the dash and whisk to combine. Bring to a gentle simmer to dissolve the miso. Add the mushroom and wakame and simmer for a few minutes until the mushrooms are tender. Add the yuba strands and heat through. Remove one cup of broth to a small pot and bring to a boil. Add the clams and cover to allow them to cook, about 4 minutes. 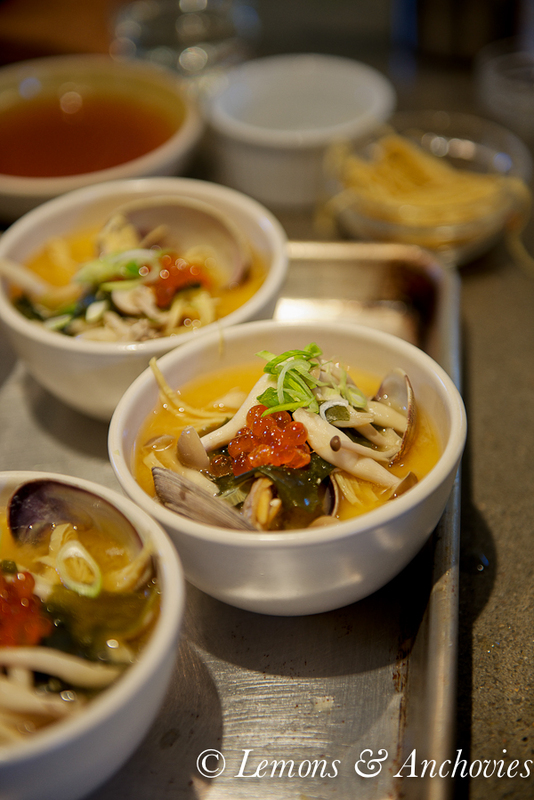 Transfer the clams to the miso broth and strain in the clam broth (to make sure sandy residue is left behind). Place ½ cup portions of silken tofu in 6 bowls. Ladle the soup with the clams, mushrooms and yuba strips. Garnish with mitsuba and dot with ikura. A vegan version of Deviled Eggs that won't leave you feeling at all like you've compromised on taste and texture. 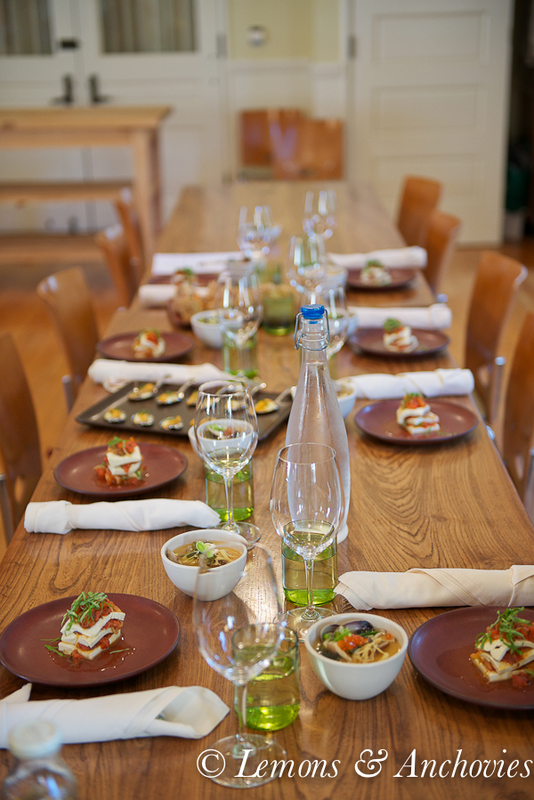 Courtesy of Cavallo Point Cooking School. To make the mayo: blend the soymilk and mustard together. With the blender still running, slowly drizzle in the oil in a thin stream. Add the lemon juice and pulse to combine. Combine with the dressing ingredients and set aside. Cut the tofu in 1-inch thick slices and transfer to a saucepan. Cover with salted water and bring to a boil. Simmer for 15 minutes then gently remove and drain. Place on a kitchen towel and pat dry. Mash the tofu lightly with a fork, leaving pea-sized chunks. Sprinkle the black salt. Toss the mashed tofu with the chopped shallots, celery, cilantro and raisins. Add the dressing and toss to combine. Serve on top of rice crackers. What a fun experience! 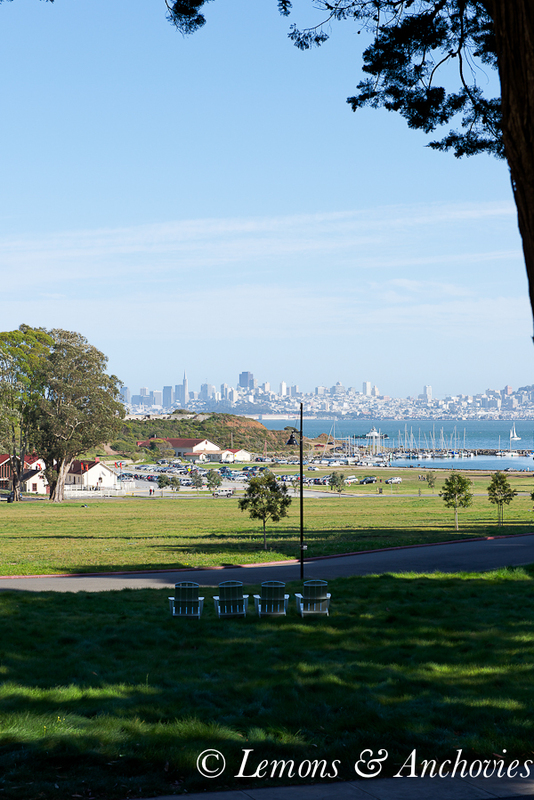 I’ve visited Cavallo Point before and toured the kitchen before a class started, it’s such a cool space! Now you’ve convinced me to check out the list of upcoming classes. 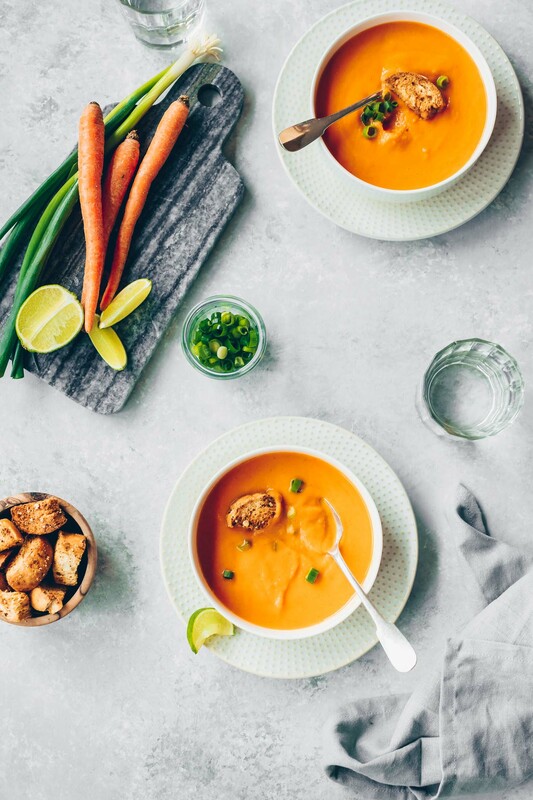 Your soup looks wonderful! 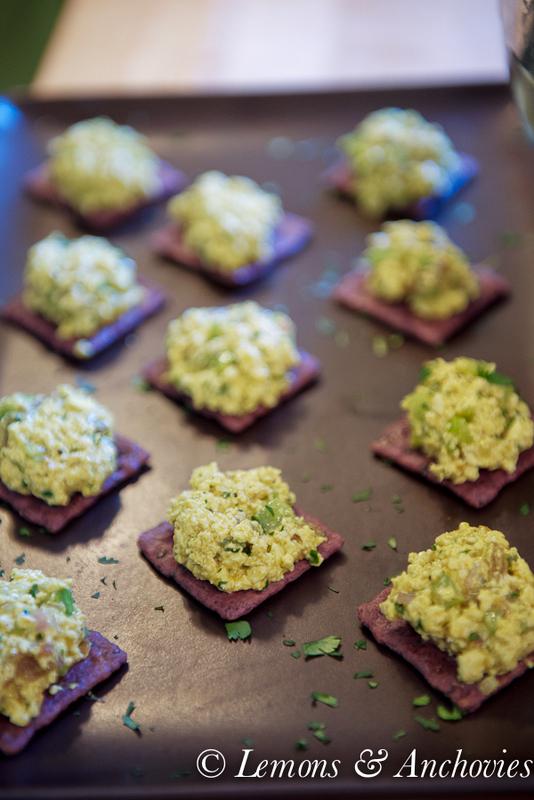 The Vadouvan Deviled tofu sounds (and looks!) wonderful! 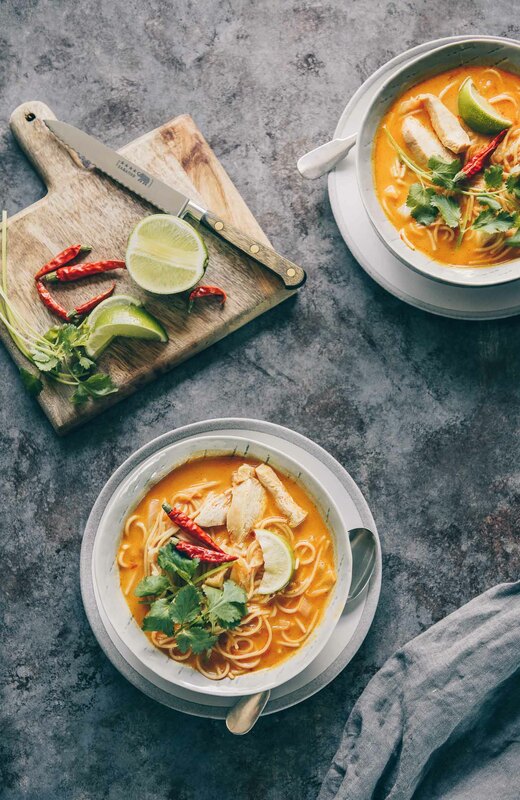 Thanks for sharing everything you learned – the photos are making me unbearably hungry. Maybe it’s time to rediscover my love for tofu! Wow, what a fun time you had! Sounds amazing! An interesting class. Both tofu recipes are wonderful. Tofu is so delicious and versatile!